North American Animals - Part 1 of 5, - Nordamerikansk dyreliv - with Reindeer or Caribou, American black bear, Brown Bear, American bison, Arctic fox, Red Fox, Alaskan Hare, Arctic Hare, Snowshoe Hare, Black-tailed Jackrabbit, White-tailed Jackrabbit, Pygmy Rabbit and Riparian Brush Rabbit. 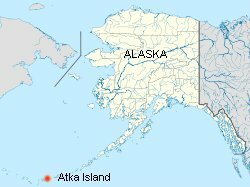 with wildlife in North-America, that is Canada and USA, including Alaska, but not Hawaii. pictures, and possibly videos too, from other sources while working on these pages. Please be patient. We start on February 20th, 2012. 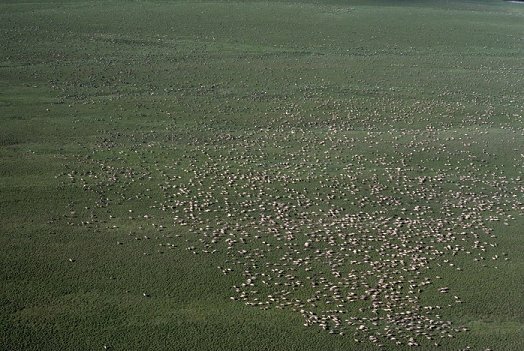 Caribou aggregation , Rangifer tarandus. On the Arctic Refuge coastal plain. some of its subspecies are rare and one (or two, depending on taxonomy) has already gone extinct. Reindeer vary considerably in color and size. Both sexes grow antlers, though they are typically larger in males. There are a few populations where females lack antlers completely. important to several Arctic and Subarctic people. 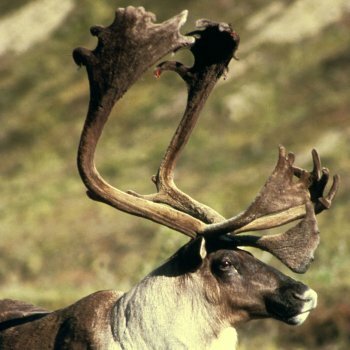 Peary caribou, Rangifer tarandus pearyi, found in the northern islands of the Nunavut and the NW Territories of Canada. Svalbard reindeer, Rangifer tarandus platyrhynchus, found on the Svalbard Is.of Norway, is the smallest subspecies. Mountain reindeer, Rangifer tarandus tarandus, found in the Arctic tundra of Eurasia, including the Fennoscandia peninsula. 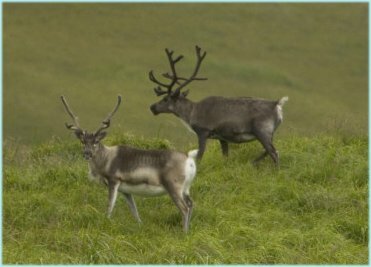 Porcupine caribou or Grant's caribou, Rangifer tarandus granti, which are found in Alaska, Northwest Territories of Canada. Very similar to Rangifer tarandus groenlandicus, and probably better regarded as a junior synonym of that subspecies. Still a lot of discussion between scientists about what is what, so will put that aside until further. of as little as 80 cm. while southern populations, which typically are relatively large, are darker. 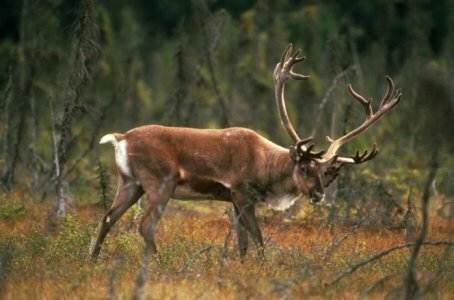 southernmost subspecies, the Woodland Caribou, is the darkest and largest. overcoat consisting of hollow, air-filled hairs. evidence to suggest that on occasion, they will also feed on lemmings, arctic char, and bird eggs. Reindeer herded by the Chukchis have been known to devour mushrooms enthusiastically in late summer. 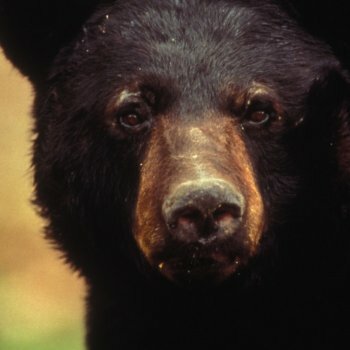 The American black bear or North American black bear, Ursus americanus is a medium-sized bear native to North America. It is the continent's smallest and most common bear species. 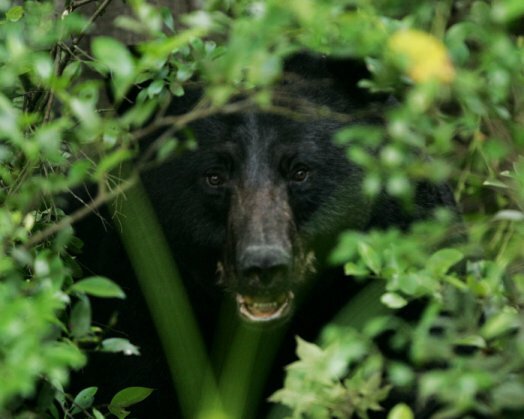 Black bears are omnivores, with their diets varying greatly depending on season and location. They typically live in largely forested areas, but do leave forests in search of food. have a ' widespread distribution and a large global population estimated to be twice that of all other bear species combined. common to many species of bears. 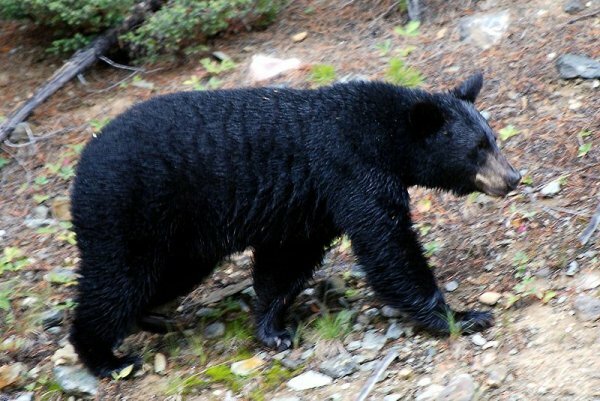 in autumn, their pre-den weight tends to be 30% higher than in spring, when black bears emerge from their dens. and 70105 cm in shoulder height. The tail is 8 18 cm long. and Polar Bears. The biggest wild American black bear ever recorded was a male from New Brunswick, shot in November 1972, that weighed 409 kg after it had been dressed, meaning it weighed an estimated 500 kg in life, and measured 2.4 m long. nocturnal, but juveniles are often active in daytime. whose population sizes are unknown. 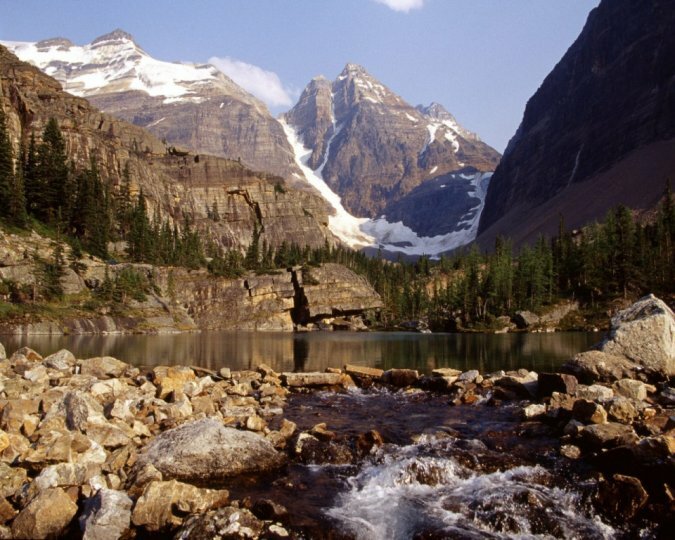 Canadian Rockies, Alberta, home of the Black Bear. familyand as the largest land-based predator. 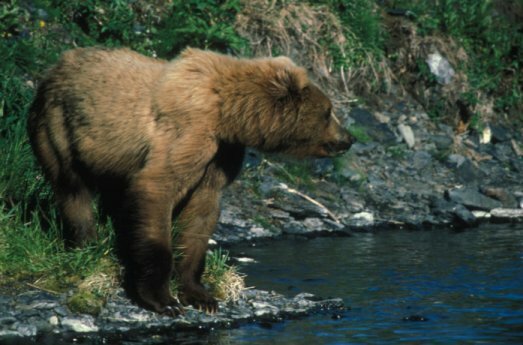 the coastal brown bear and the inland grizzly, and the two types could broadly define all brown bear subspecies. 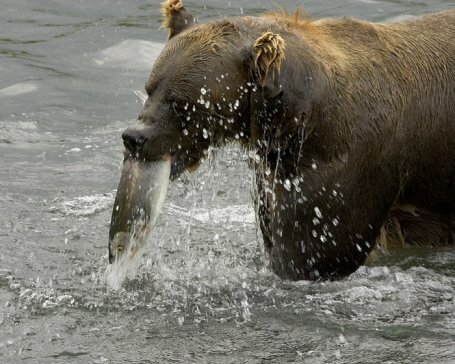 Grizzlies weigh as little as 160 kg in Yukon, while a brown bear, living on a steady, nutritious diet of spawning salmon, from coastal Alaska and Russia can weigh 682 kg. The exact number of overall brown subspecies remains in debate. The brown bear's range has shrunk, and it has faced local extinctions, with a total population of approximately 200,000.
but also Ukraine, Slovakia, and so on), the Balkans, Sweden and Finland, where it is the national animal. 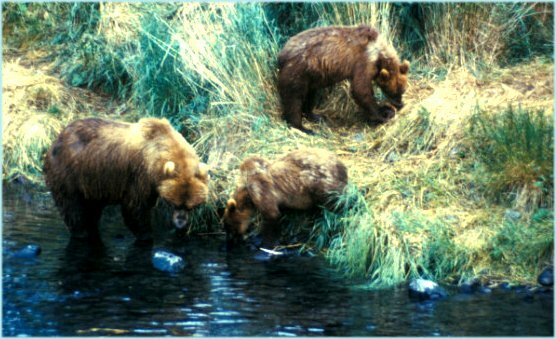 The brown bear is the most widely distributed of all bears. 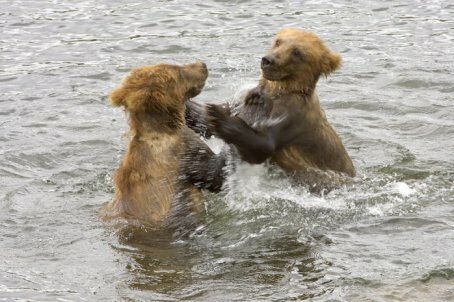 Brown bears have very large and curved claws, those present on the forelimbs being longer than those on the hind limbs. bears The claws are blunt, while those of a black bear are sharp. lower 48 states, they are repopulating slowly but steadily along the Rockies and the western Great Plains. and some 85-90 animals in Asturias, Cantabria, Galicia and León, in the Picos de Europa and adjacent areas in 2003.
and some 100 animals in 2005 in the west, to Russia in the east, and from Sweden and Finland in the north to Romania (40005000). although they may gather in large numbers at major food sources and form social hierarchies based on age and size. a lateral orientation, by turning away and dropping the head and by sitting or lying down. 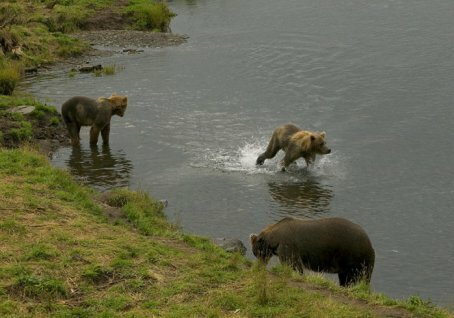 A brown bear sow searches for food with her two yearlings. to humans causes them to lose their natural shyness, and, in some cases, to associate humans with food. in serious injury and, in some cases, death. Our best advise: Keep to our pages, don't try to look them up by yourself. extinct and is today restricted to a few national parks and other reserves. hump, and the wood bison, Bison bison athabascae  the larger of the two and having a taller, square hump. Chianina, the Asian gaur and wild Asian water buffalo. It is the largest extant land animal in North America. 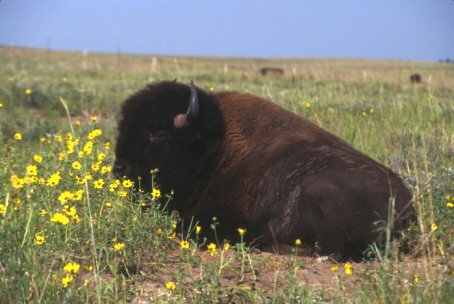 Close view of buffalo, bull and cow standing side-by-side in tall grass and wildflowers. which they use in fighting for status within the herd and for defense. periods of grazing, resting and cud chewing, then moving to a new location to graze again. 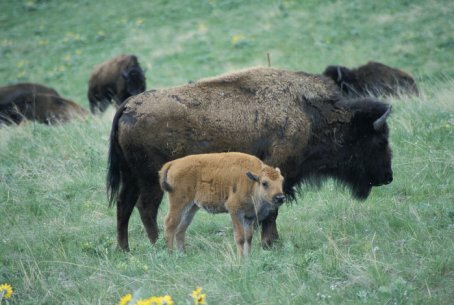 Bison mate in August and September; gestation is 285 days. 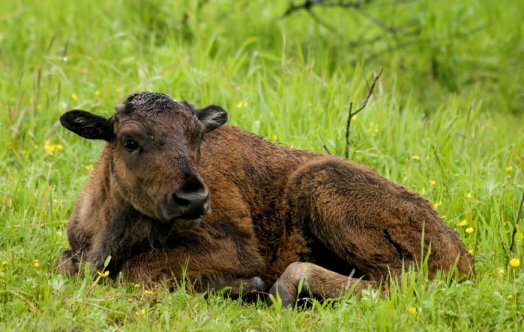 A single reddish-brown calf nurses until the next calf is born. If the cow is not pregnant, a calf will nurse for 18 months. Bison cows are mature enough to produce a calf at 3 years of age. until they reach 5 years of age. 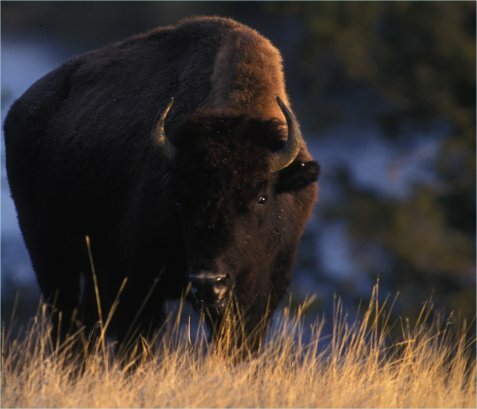 Bison have a life expectancy of approximately 15 years in the wild and up to 25 years in captivity. white buffalo, in which the calf turns entirely white. White bison are considered sacred by many Native Americans. described as having "wild and ungovernable temper"; they can jump 6 feet vertically, and run 5565 kph when agitated. 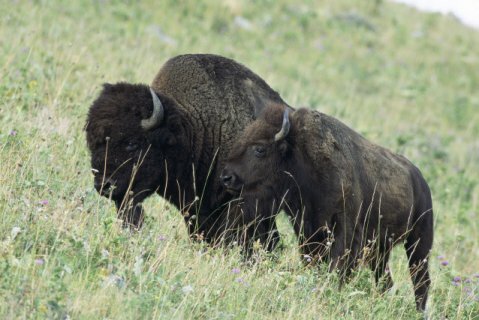 ranches.The total population of bison in wild is approximately 30,000 individuals and the mature population consists of approximately 20,000 individuals. 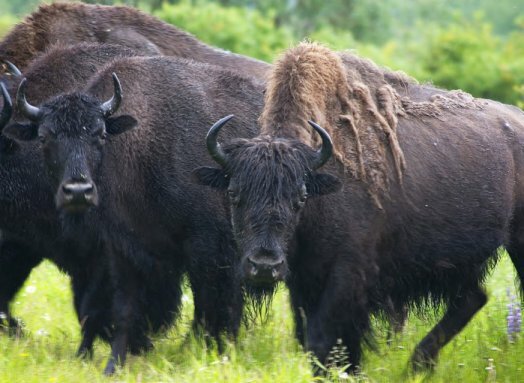 Of the total number presented, only 15,000 total individuals are considered wild bison in the natural range within North America (free-ranging, not confined primarily by fencing). suitable open meadow habitat for wood bison throughout their range through about 1990. 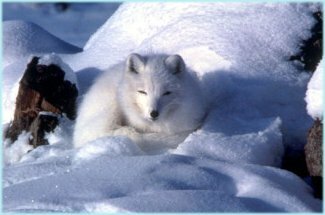 Arctic fox, Alopex lagopus, curled up in snow in Alaska in winter. 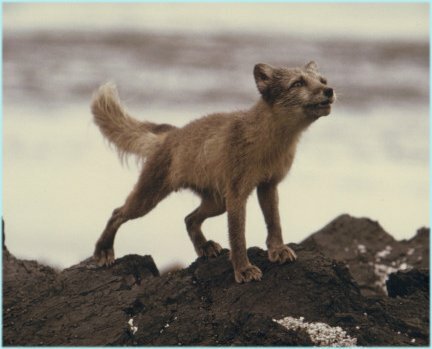 is a small fox native to Arctic regions of the Northern Hemisphere and is common throughout the Arctic tundra biome. 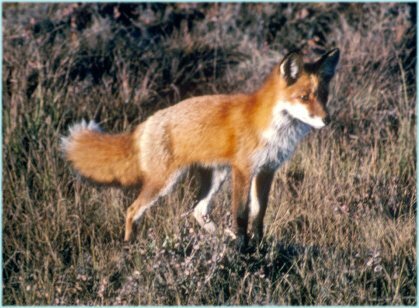 genetic evidence places it in Vulpes (Mammal Species of the World) with the majority of the other foxes. with the seasons: in the winter it is white to blend in with snow, while in the summer it is brown. Read more about the Russian Arctic Fox here. animals, but with what result for themselves? part of its diet. They also consume berries and seaweed and may thus be considered omnivores. the arctic fox will bury what the family cannot eat. 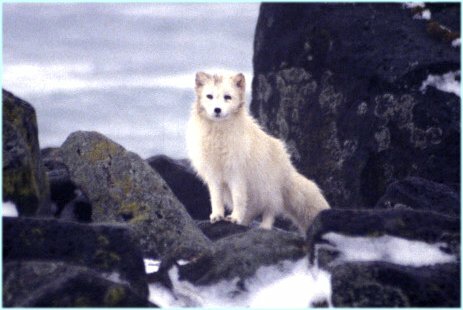 When its normal prey is scarce, the arctic fox scavenges the leftovers and even feces of larger predators, such as the polar bear, even though the bear's prey includes the arctic fox itself. 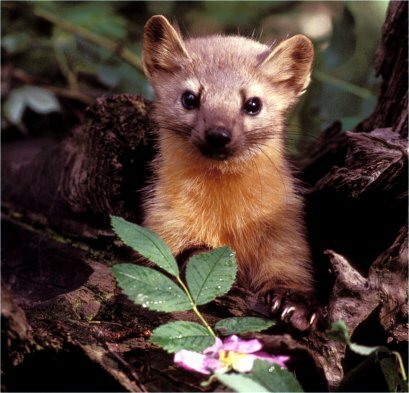 considered harmful to native mammal and bird populations. It is listed among the "world's 100 worst invasive species. two categories: the large northern foxes, and the small, primitive southern foxes of Asia and the Middle East. to attack from larger predators such as wolves, coyotes, golden jackals and medium and large felines. 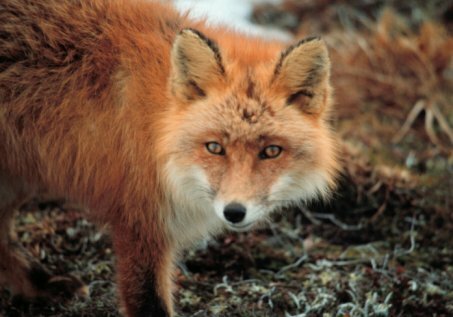 population, the red fox is one of the most important furbearing animals harvested for the fur trade. have only four and lack dewclaws. They are very agile, being capable of jumping over 2 metre high fences and swim well. 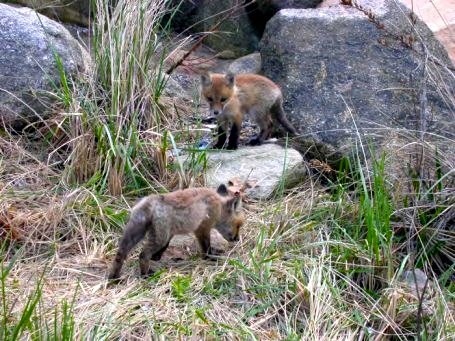 Two baby Red Foxes, Vulpes vulpes , Buzzards Bay, MA. and the hind feet 1218.5 cm. They weigh 2.2 to 14 kg , with vixens typically weighing 1520% less than males. long male, killed in Maidstone, Kent in early 2011. The Alaskan Hare, Lepus othus, also called the tundra hare, is a species of mammal in the Leporidae family. It is found in the open tundra of western Alaska and the Aleutian Islands in the United States. 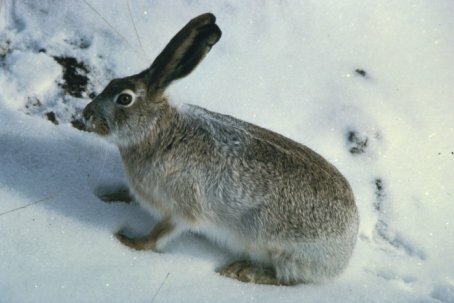 The Alaskan hare is larger than the Snowshow Hare  50 to 70 cm. in length and 2.7 to 5.4 kg in weight. is grayish brown above and white below, with a whitish base to the hairs. The tail is entirely white. and wooded areas. It feed on willow shoots and various dwarf arctic plants. The arctic hare, Lepus arcticus, or polar rabbit is a species of hare which is adapted largely to polar and mountainous habitats. 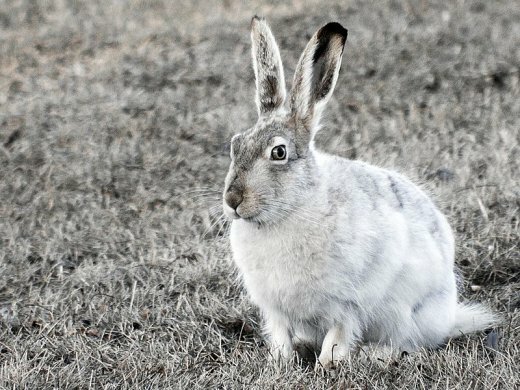 The arctic hare survives with a thick coat of fur and usually digs holes under the ground or snow to keep warm and sleep. background changes. 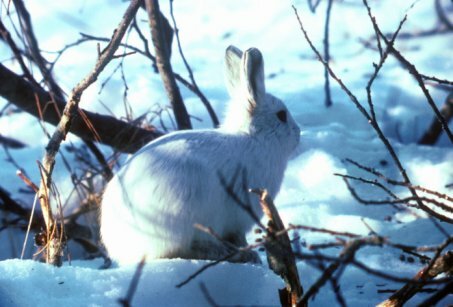 However, the arctic hares in the far north of Canada, where summer is very short, remain white all year round. On average arctic hares measure 5570 cm long, and weigh about 45.5 kg. standing where there is less snow to easily locate twigs or plants that fall off or lie on the ground for them to chew on/feed on. 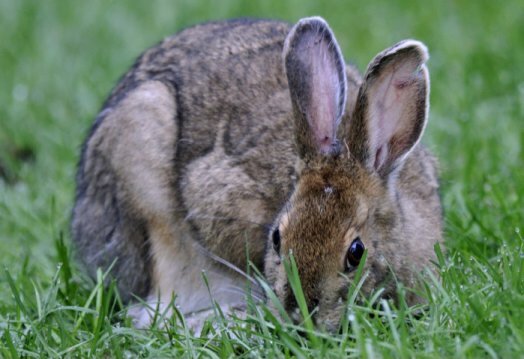 Although hares are known for eating plants, they can eat meat. Snowhoe hare at Kennebago Lake, Maine. 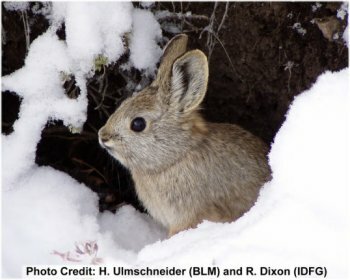 For camouflage, its fur turns white during the winter and rusty brown during the summer. Its flanks are white year-round. and females may breed with several males. 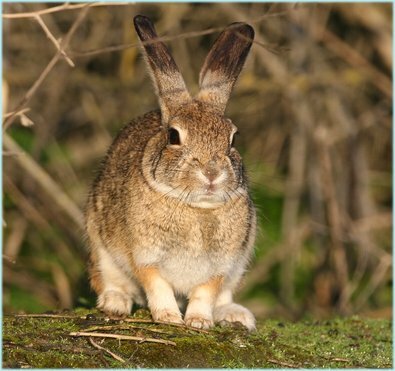 More about hares and rabbits - click here. jackrabbit and the white-tailed jackrabbit. 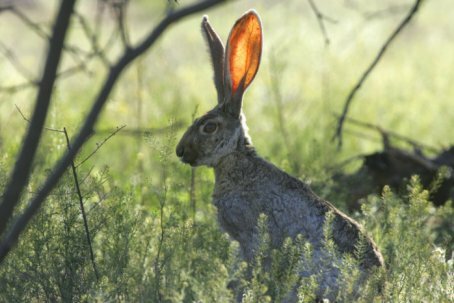 The black-tailed jackrabbits occupy mixed shrub-grassland terrains. Their breeding depends on the location; it typically peaks in spring, but may continue all year round in warm climates. as two and as high as seven in warm regions. 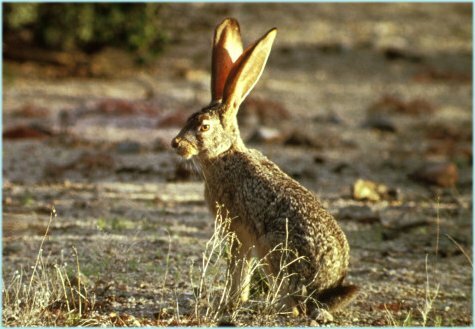 The black-tailed jackrabbit does not migrate or hibernate during winter and uses the same habitat of 13 km2 year-round. 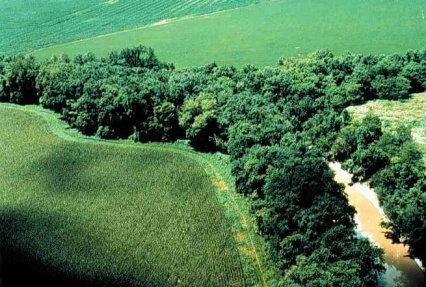 diets, while grasses and forbs are used in spring and early summer, but the pattern and plant species vary with climate. hunters often avoid collecting them. 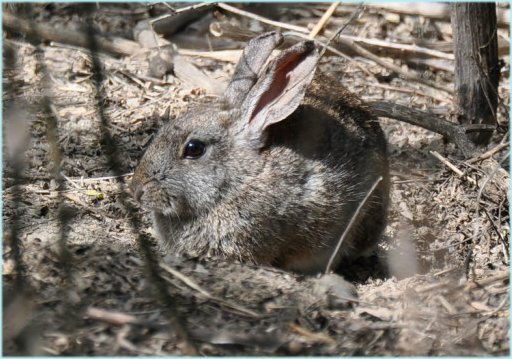 member of family Leporidae of order Lagomorpha. 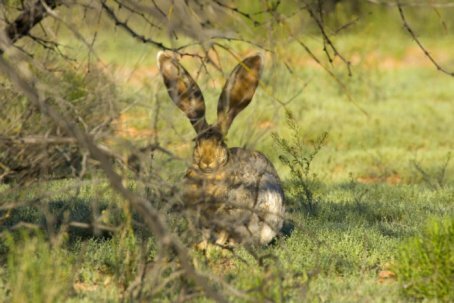 This jackrabbit has two described subspecies: Lepus townsendii townsendii and Lepus townsendii campanius. with shrubs during the winter. from one to 11. Longevity is unknown but speculated to be up to five years. Source: Smith, A.T. & Johnston, C.H. 2008. Lepus townsendii. In: IUCN 2011. IUCN Red List of Threatened Species. Version 2011.2. <www.iucnredlist.org>. Downloaded on 20 February 2012. Conservation of Nature lists the species as lower risk. of brush rabbits native to California. This one is at the San Joaquin River National Wildlife Refuge in California's Central Valley. in MSP. 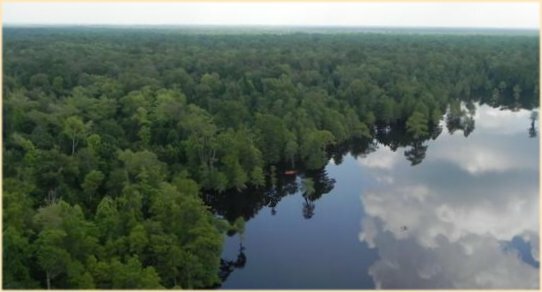 It occupies an elevational range of 0-2,070 m.
occurs in about 90% of the park's 102 ha when populations are high, but about 20-40% of the Park at other times. D.F. 2008. Sylvilagus bachmani. In: IUCN 2011. IUCN Red List of Threatened Species. Version 2011.2. <www.iucnredlist.org>. Downloaded on 20 February 2012. That brings us to the end of page 1 of this North American Wildlife tour. but you go to page two right now.